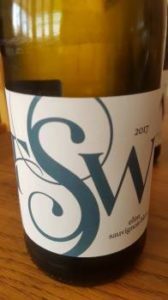 Trizanne Barnard has done something quite special with her Elim Sauvignon Blanc 2017, this Elim wine looking showing particular refinement and composure. The nose shows subtle notes of lime, pear, white peach and blackcurrant while the palate is concentrated but not weighty – lovely fruit purity, coated acidity and a gently savoury finish. Very more-ish and good quality relative to price given an approximate retail price of R110 a bottle. What was the Syrah Grenache is labelled as a straight Syrah from the 2015 vintage, the wine still containing some Grenache but this down to 15% from 20% of the blend and therefore Barnard not obliged to declare it. From Swartland fruit, the wine shows more black fruit than in the past plus black olive, earth and a hint of spice. Nice fruit expression, smooth textured in a good sense, this remains a wonderfully accessible drop. Approximate retail price: R110 a bottle.